People expecting anything closely resembling Sonic Youth were going to be disappointed with Body/Head's set. 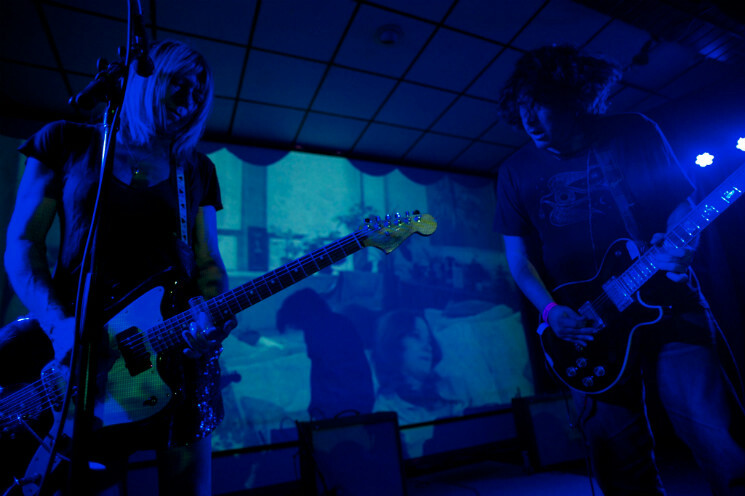 The duo of Bill Nace and Kim Gordon had been a bucket-list gig for many at Sled Island thanks to Gordon's involvement, and Body/Head's short performance subverted those expectations by keeping it minimal and avoiding anything resembling convention. The music had a glacial pace to it at times, especially given the lack of drums present, and Gordon kept her vocal parts to grunts and short phrases, peppering them throughout the sea of dirge-y guitars. Yet the music never got too abstract or aggressive; it felt almost meditative at moments, as the duo kept themselves within a tightly confined musical space they'd explore through their playing. The duo were fantastic improvisers, and even when Gordon and Nace took to wringing waves of feedback out of their guitars, it didn't sound jarring. In many ways, having Body/Head headline at Sled Island was a move only the festival could make. Regardless of your feelings towards their music, they drew in an at-capacity crowd — many who were watching them for the first time — and had them captivated, revelling in noise for nearly an hour. That has to count for something.